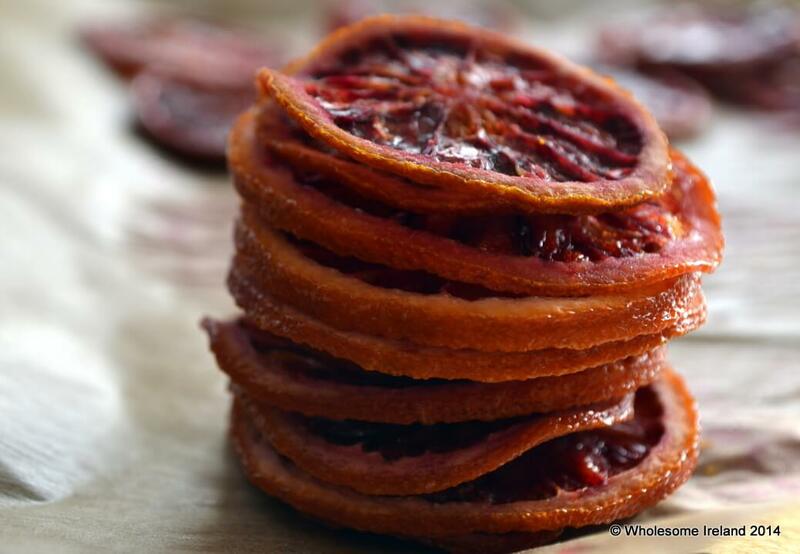 These are blood orange crisps, but this recipe isn’t just limited to blood oranges, it’s just I had blood oranges and they look so pretty when they’re preserved. If you want to make an incredibly easy gift that looks amazing in jar, like you paid loads of money to buy then keep on reading. They can also be used to decorate cakes, or hung on ribbons in the house. Last Sunday morning was an early one. I say that like early mornings are unusual, they’re not. Most days I start at about 6.30am as that’s what time the boys wake up/himself leaves for work. Weekdays I try and get an hour’s work done before I get the 5 year old off to school, but weekends I give myself a little break and snuggle with them on the sofa for a bit. Last Sunday though I had a burst of energy so made these orange crisps. They’re not complicated but as a bonus I’ve 2 different methods to make them with differing results too! 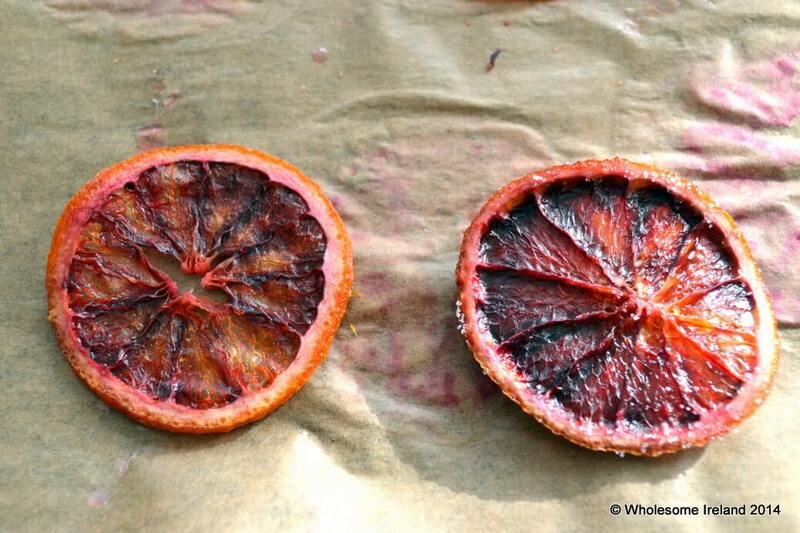 Finely slice the blood oranges. You’ll need to do this as thinly as possible without shredding the delicate flesh. Meanwhile preheat a fan oven to 80 degrees Celsius and line a baking tray with non-stick greaseproof paper. Take a large saucepan and warm together the caster sugar and water until the sugar has dissolved then bring the temperature to a gentle simmer. Immerse the orange slices in the syrup for 3 minutes before (carefully) lifting them out and placing on the lined baking tray. Bake in the oven for 3 hours, turning every 30 minutes to encourage the slices to dry evenly. Preheat a fan oven to 80 degrees Celsius and line a baking tray with non-stick greaseproof paper. Finely slice the oranges as thinly as possible without shredding the flesh inside. You’ll need a very sharp knife or a mandolin. Sprinkle half the sugar (50g) evenly over the lined baking tray then place the slices of orange evenly on top. Sprinkle the remaining sugar (50g) on top of the oranges. Bake in the oven for 3 hours, turning every 30 minutes to allow them to dry evenly. Above you can see the results. The left hand side is the crisps made using the syrup method. The flesh has retracted more and it has a wide section gap in the middle. Handy if you want to hang the orange slices as decorations. The right hand side is the crisp made using the sugar only method. The colour is more concentrated and more of the flesh is intact so it’s more suitable for decorating cakes. 🙂 Next investment is either a dehydrator or a smoker. It’s a toss up at the moment! I’d love a big good quality dehydrator but they cost a lot of money and take up a lot of space. Mine is this cheap one http://www.amazon.co.uk/Andrew-James-Dehydrator-Adjustable-Temperature/dp/B009DIFMXK/ref=sr_1_1?ie=UTF8&qid=1391540969&sr=8-1&keywords=dehydrator – it is a bit fragile but I’ve dried an awful lot of fruit,veg, jerky, kale crisps etc in it at this stage. Sure that looks grand, so long as it does the job! I’m not waiting on the cool bag so don’t worry. When I talk about a smoker, I’m talking one that’s a fairly big size. We have bacon to smoke after all!